Lankford made his major league debut with St. Louis in August 1990, and soon after took over the center field position previously occupied by former National League Most Valuable Player Willie McGee. He started his career as primarily a leadoff man, where his speed and plate discipline made him a potent force. In his first full season in 1991, he led the league with 15 triples, stole 44 bases, and scored 83 runs, earning him a third place finish in the Rookie of the Year voting. He also accomplished the rare feat of hitting for the cycle, becoming the first Cardinal rookie ever to do so. In 1992, he began to hit for more power, and posted a breakout season with a .293 batting average, 20 home runs, and 42 stolen bases. This season established Lankford as one of the best all-around outfielders in the game. He eventually moved down in the batting order to take further advantage of his power hitting ability. 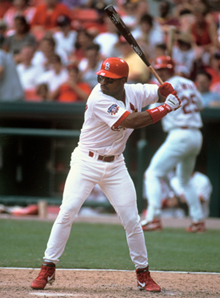 Lankford posted five seasons of 20 home runs and 20 stolen bases with the Cardinals (1992, 1995-1998), making him the only player in franchise history to accomplish the feat more than once. He also was an impressive fielder, posting a 2.90 range factor in 1992 and committing only one error in 1996. In the latter season, he led the league with a fielding percentage of .997 but was still not awarded a Gold Glove. After his legendary days on the field in St. Louis, Ray is now available for corporate appearances, motivational speaking engagements, VIP meet and greets, autograph signings, baseball camp, celebrity golf tournaments and product endorsements. Hire Ray to meet and mingle with your best customers, clients and employees. Contact celebrity agent, Ryan Totka at 1.888.246.7141 for booking. There are many great baseball speakers to share their stories on and off the field and Ray is a 16 year MLB veteran who gives a great testimony about motivation, setting goals and life in Major League Baseball.